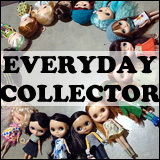 BlytheLife.com » Interview with Eliana of ClassicBlythe & Giveaway! The third featured talent for the 2016 March Talent Showcase is Eliana of ClassicBlythe! She creates such fun things, I was very excited to get to know her – and now to share what I learned with all of you! Hello Eliana! Please tell us a little bit about yourself. Hello, my name is Eliana and I am from Argentina. I’m a photographer and I own a hardware store but I can’t stop doing and looking for creative things to do with my free time. Thanks to Blythe, I learn new things every day and develop new skills. Not to mention the great people you meet from around the globe. I discovered Blythe about four years ago. 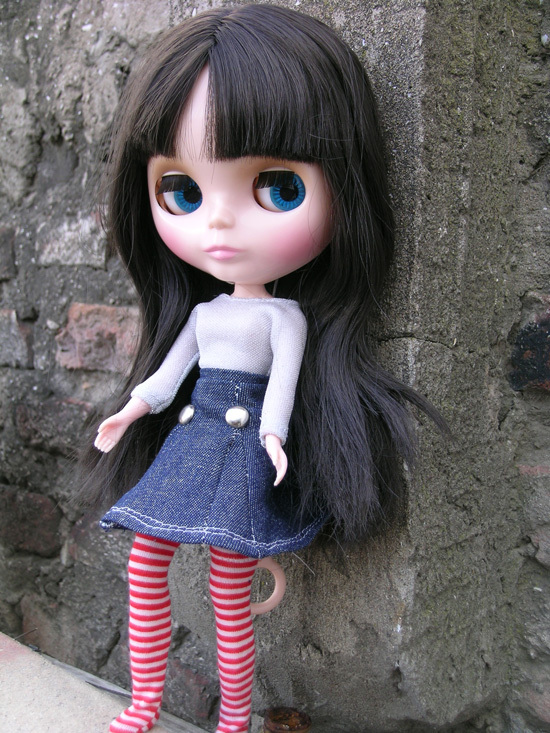 I’ve always loved dolls and one day just googling I discovered a Blythe by Melacacia. As a doll lover and photographer I couldn’t help falling in love with that picture, so I started searching for “big head doll” and “big eyes doll” I didn’t have to look again, it was late for me so I started looking where to buy, haha. Who is in you doll family right now? My doll family has 18 members right now (13 Blythes, two Icys, one Pullip and two Dals), and I think that I’ve reached a point where I start being a lot more conscious about who is going to get in it, because is going a little out of hands. How did you start sewing for Blythe? My grandmother taught me how to sew when I was fifteen years old with an old pedal sewing machine. Since then I’ve started making all kind of things, after discovering Blythe the step was mandatory, that and the fact that is very difficult to get things from abroad, because we have a not very good exchange rate and because the government has restrictions on how many purchases a person can make a year (two is not a very large number sadly). 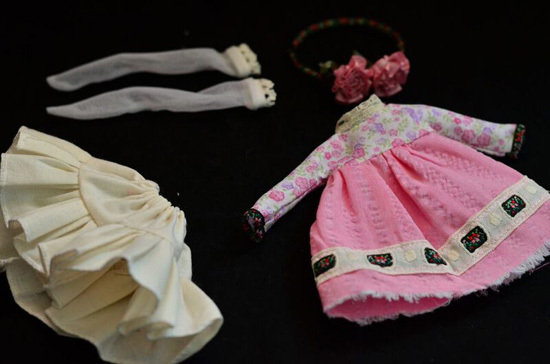 So I started making clothes for my dolls and I found it very therapeutic, I can spend hours sewing or just looking at the fabrics trying to make color schemes on my head. For me is like a getaway from a very busy world. My first sewing project was a denim skirt, with the T-shirt and socks, it turned out very well, sadly that was also the moment when I discovered, in the worst way possible, that some fabrics stain the body, from that moment on I use that same body to try every little piece of fabric I use. What made you decide to start selling your clothing on Etsy? Some friends of mine encouraged me, they bought somethings, some others had their own Etsy shops, and I started thinking that maybe it could be a good thing try earning some “dolly dollars” so I can buy whatever I wanted. What has been your most favourite piece that you have created so far? My most favourite piece has to be an English dress set, it has a lot of details and I really like it. 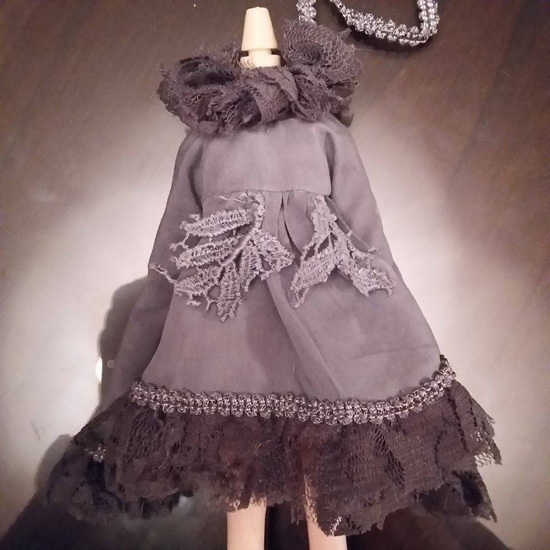 Also a custom hand dyed dress is grey with x-long sleeves and some hand-dyed lace, anyway I hope I can make it better with time. What has been one of your most challenging pieces so far? What made it challenging and how overcome those challenges? The most challenging piece, has to be the grey dress, it was challenging because it was a custom order and a very specific one, I had to fulfill my client expectations, keep my style and make it affordable. I ended up hand dyeing laces, and fabrics in order to make it the way we both wanted it. Finally that dress became one of my favourites, because it made me see that I could make some better things than just some plain dresses, it was a breaking point, that’s why is one of my favourites. 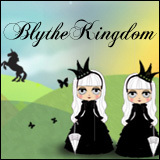 Tell us about how your day is like when are spending time working on things for ClassicBlythe. I can’t work on ClassicBlythe everyday because I have to work into adult stuff, the good thing is, that when I can make the time to sew I really enjoy it, it’s the best part of my day. Normally I do it at midday when I have about three hours and I’m alone because my husband is not at home, so I can spread out a lot of fabric on the table to try to make the scheme that I like, small things as hand sewing and embroidery I leave them for the afternoon, because I’m no ta lone anymore and it doesn’t take so much space. What are some tools that you think you couldn’t live without? My scissors, my pin cushion and a box full of fabric, it doesn’t matter if I use them all or not, I just like to look at it. What has been one of the most exciting moments for you since opening ClassicBlythe? It has to be my first sale, I woke up to find that something has sold on Etsy, strangely it was not a dress but a custom Blythe. Best moment ever. Thank you for doing this interview with me, Eliana! 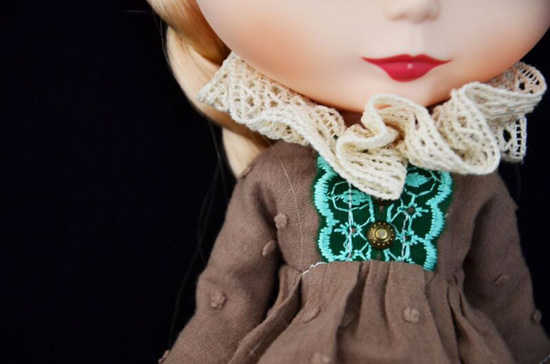 What advice do you have to share with someone who’s thinking of opening up an Etsy shop for Blythe? 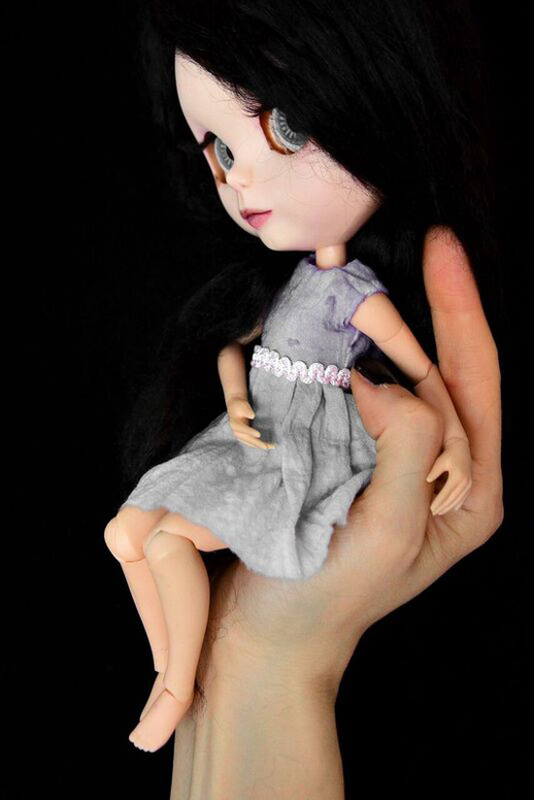 Only one advice, patience is the key, sometimes you spend a lot of time and sell nothing, but is important to be patient and of course sew what you like, something you can be proud of, something your dolls may use, those things that when you finish them you just think: I can’t sell this, I want it for me. Thanks a lot for the interview it was really a big pleasure. 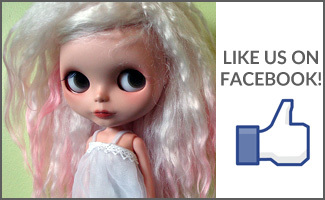 You can learn more about Eliana and ClassicBlythe on Etsy, Facebook, YouTube, and Instagram. Eliana has generously decided to giveaway one dress to one lucky reader here on BlytheLife! 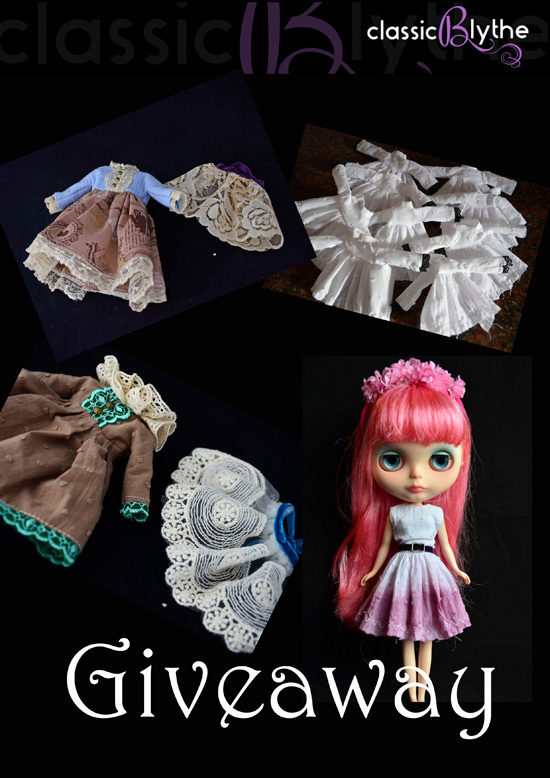 The winner will get to choose from Eliana’s existing stock from her ClassicBlythe Etsy shop, or opt for a custom made dress (minimum 15 days turn-around time prior to the dress being posted). The giveaway runs until Saturday March 26th 2016 at 11:59pm Pacific. The draw will be held on Sunday March 27th 2016 and the winner will be announced on BlytheLife.com. Remember to use a valid email address for all comments. If you win, your email will be forwarded to Eliana so she can get in contact with you regarding sending you the prize. Such gorgeous dresses! Love the unusual uniqueness of each look. The detail on these dresses is gorgeous. Keep up the good work! What beautiful craftsmanship and such lovely work! That grey dress is beautiful! I’m glad she loves her work and how in making that dress Eliana had a “YES!” moment and a client got the dress they dreamed of. Lovely lovely work! A very interesting read, especially about some fabrics staining Blythe’s body!! Love all the detailing in the dresses especially the lace. Oh, these dresses are beautiful! I love these interviews with creators – thank you for sharing about your creative process! I love your work, Eliana! Great interview. I own many dresses from Eliana and I can tell you they are beautifully made and are very detail oriented.